Recently we packed our bags and headed to the city that never sleeps for a big ole dose of inspiration! Specifically, we were going to the Architectural Digest Design Show, a celebration of the best in interior design, furnishings, handmade decor, appliances, and more. But let’s be honest, New York City is a design muse in itself. We’ve returned invigorated and excited to share what we experienced while we were there. This sign by one of our favorites, Frank Lloyd Wright, really captured the trend and tone of the show and beyond. This blend of inside and outside themes, intersecting and collaborating in strikingly cohesive ways. Organic patterns, lush, moody colors and wood grains happily mixing with hard lines and architectural vibes. Very otherworldly, but not in the least overwhelming. 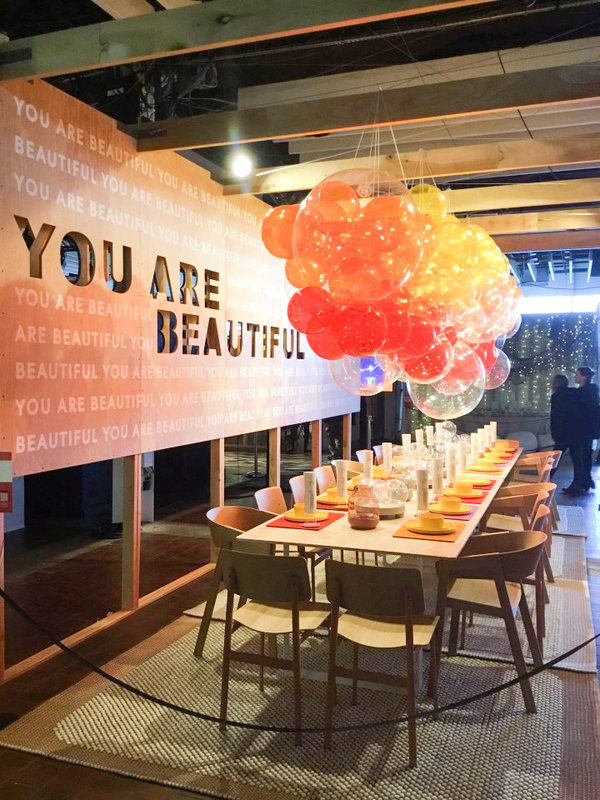 At the show, Diffa Design, which stands for Design Industries Foundation Fighting Aids, enlisted a range of companies and designers to decorate tables, raising funds for its cause. Many embraced the inside/outside theme, and others just had fun with it! Here are some of our favorites. We ventured out to the New York Design Center, another place with just so much raw inspiration. This window in particular really struck a cord with us. The idea of the “New Traditionalist” is something we feel like we embrace with every project we work on. Updating, making modern, while embracing and never forgetting the history and tradition. Like this chair, with its modern lines, traditional tartan and pop of millennial pink- a mixture of genres to make the perfect piece. Took a stroll through Restoration Hardware resisting the urge to sit down and pretend we live in this New York loft. So many floors of effortless elegance! We had to visit the Beekman Hotel, known for it’s beautiful architecture and design. Click here to see more! It would be a missed opportunity to visit NYC and not enter an art gallery. So we did! Pop culture at its finest. Back at the AD show we came across a section of independent craftsman and designers. We had some great conversations and heard some truly inspirational stories. Very unique designs! More than just the most organized pantry you’ve ever seen, this one features the open air drawers for fruit and veg storage. We’ve been learning a lot about proper food storage, who to separate and who gets along. Something we are definitely going to incorporate! A green fridge, yes, please! True coming out with residential refrigerators, super heavy duty and amazingly beautiful! And rounding things out with a breath of fresh spring air- this tablescape!